Something about the colors of this quilt and the slashed solids remind me of the 80s and headbands, hence the name of the quilt. The quilt was actually inspired by this photo I ran across on flickr. I loved the composition of the picture, the colors, and the improv shapes. This quilt ended up taking me outside of my comfort zone. It's really minimalist and modern to me. I'm glad I tried it though and that it was done in time to photograph with my favorite spring blooming tree, which I think is a hawthorne tree. 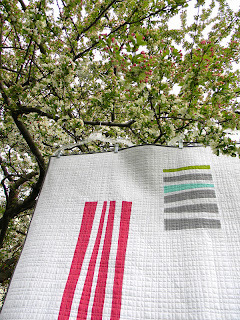 I used kona solids and my favorite lipstick shot cotton to create this baby quilt. It is 41 x 49 before washing. I took my inspiration for the quilting from the backing fabric. It is a great sketchy crosshatch flannel I found at Joanns. It reminds me of Heath, and the aqua is so pretty. I finished the binding by machine using this method again. So quick. I thought the wonky crosshatch quilting would be easy, but it was actually a little tricky to keep the random unevenness, even, if you know what I mean. And creating the wonky grid did take a long, long time. I'm pleasantly surprised with how soft and snuggley the quilt is, given the heavy quilting. Maybe it's the flannel, but it has a great drape to it even with all that thread. I'm going to wash and dry this baby quilt, and then it'll be listed in the shop. Up next, a coordinating doll quilt I made with extra blocks. 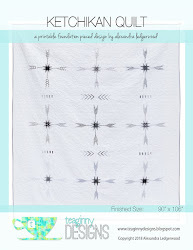 I'm not sure if I want to quilt it the same way or try something a little more feminine. Update: A pattern for this type of quilt can now be found in Improvising Tradition: 18 Quilted Projects Using Strips, Slices, and Strata . Love it! I need to find me some of that lipstick shot cotton, such a great color. 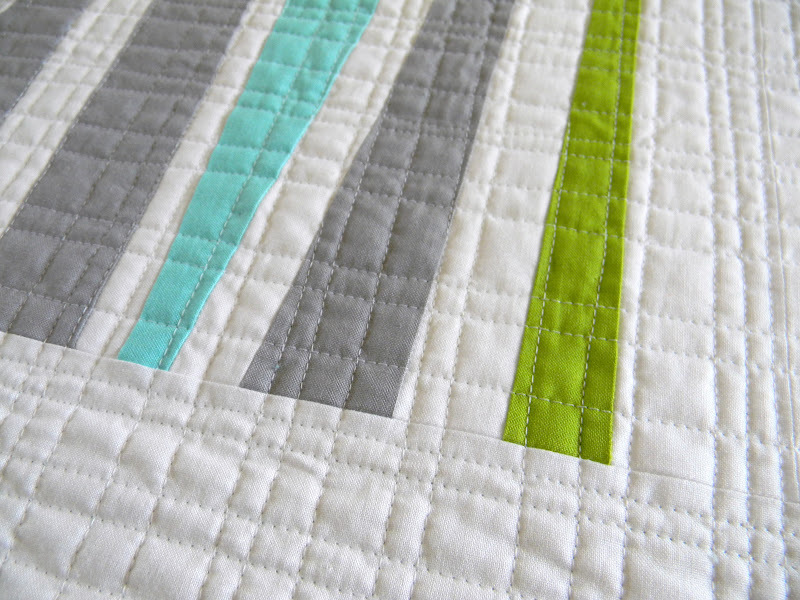 Yes, it looks like that quilting too a loooong time, but it looks great. Gorgeous. 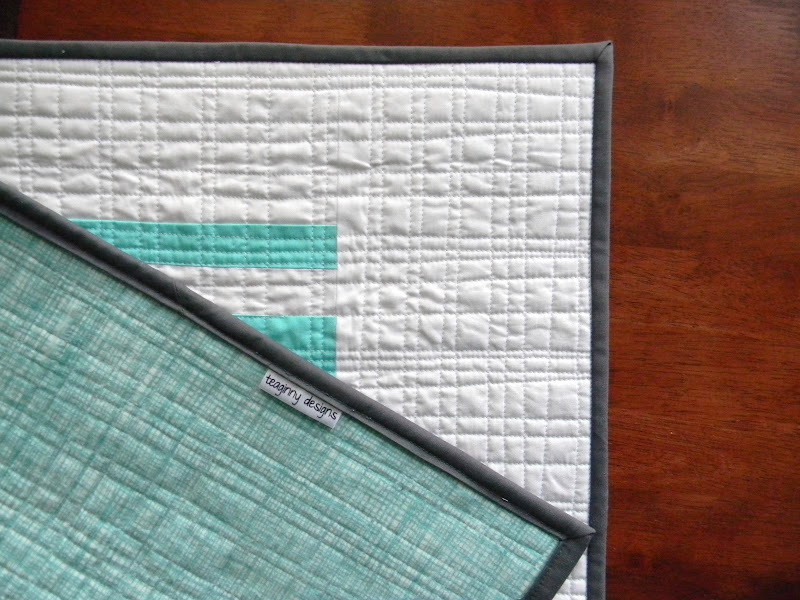 That quilting looks like it took a crazy long time, but totally worth the effect! Totally gorgeous. Is it okay with you if I add it to my pinterest inspiration board? It's lovely, Alex! I know what you mean about how long and monotonous the crosshatching can be to sew. We got a new Joann Etc. 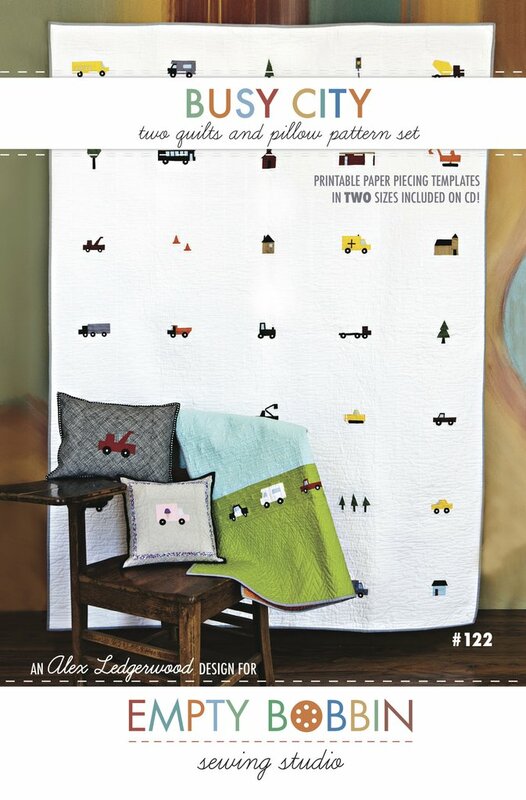 near me, and I spotted that Heathlike flannel right away....great idea for the back of a baby quilt! Love it! So modern and the quilting is perfect!! its a stunning quilt. Well done! 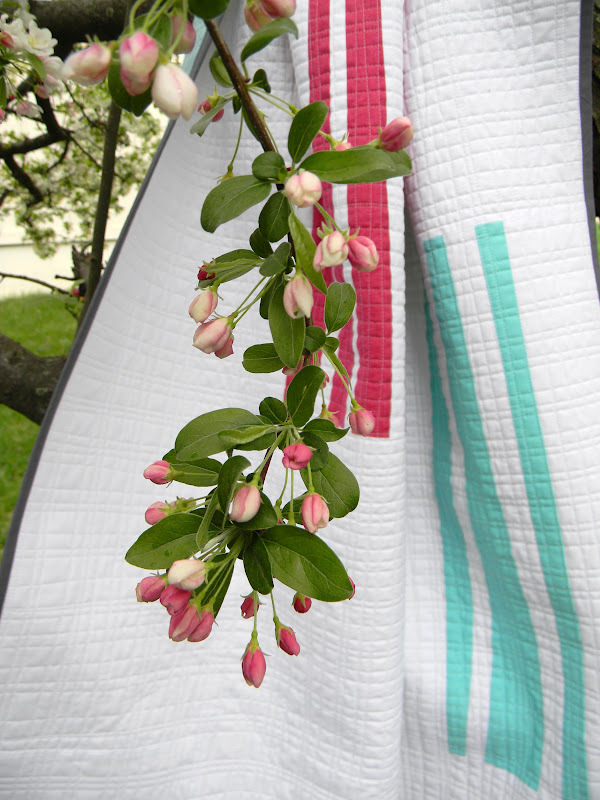 This quilt is so clean and Springlike. Beautiful work! 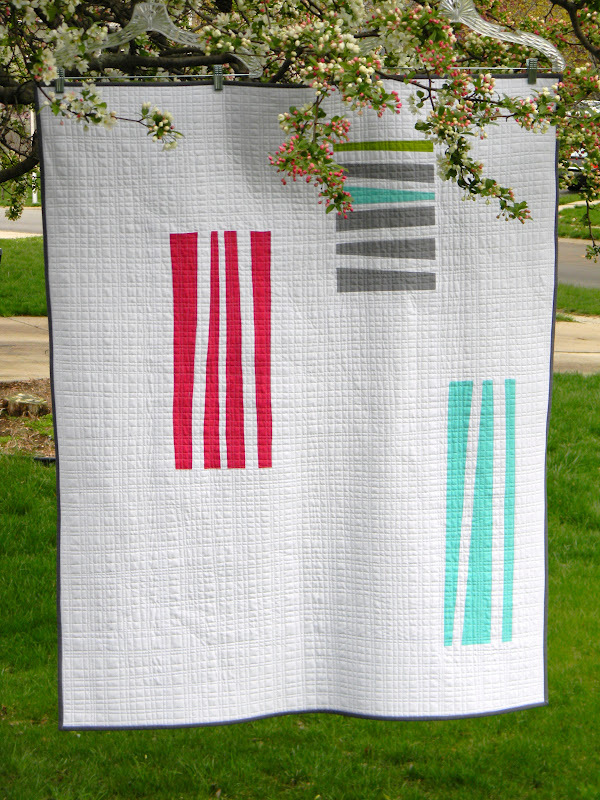 Oh, I love, love, love this quilt. Everything about it is perfect, your choice of fabric, minimalism, wonkiness, quilting, just wonderful. I love it! The quilting really adds to it! 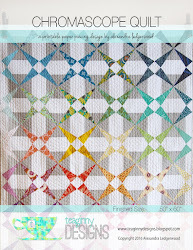 i love the inspiration for this quilt, i love the simplcity of the design and the extreme quilting! Job well done! Your uneven crosshatch looks great! Also admiring the backing. Good find. 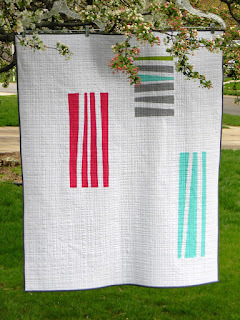 What a stunning quilt....It is so simple and perfectly balanced. The quilting choice is inspired. Close to my idea of a perfect quilt. You have set the bar high on this one. Wow. This is just the kind of quilting I can do - just straight. 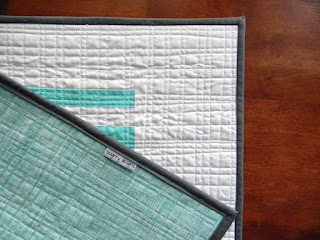 Quilt is great and I am just starting to make the modern quilts - I like the minimal look of them. You do "great" work. Love it! Question for you, how do you keep the fabric from bunching up when you sew the lines perpendicular to the original lines ... 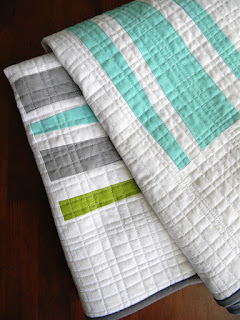 I love the look of this style of quilting, but that is always my challenge.